Sourcing has been an important part of recruiting for many years and, like many aspects of recruiting, has changed with the rise of digitalization. The tools and methods used for sourcing have adapted to our progressively digitalized lives. One tool that has become a key part of sourcing is the talent pool. In this article, we will share with you the 7 advantages of sourcing with a talent pool tool. One of the biggest advantages of using a talent network tool for sourcing is that you can easily search for and find potential candidates within your own system. You can set different filters for the qualifications you are looking for (e.g. years of experience, expertise, location) and instantly have a list of fitting candidates. These candidates are likely an even better fit because they have already expressed interest in your company. Going along with the first point, having all of your candidate pipeline information in one place will make your life a lot easier. It will save you time, money, and improve your overall decision making processes within your team. In addition, it allows everyone on the team to have access to the same information and can also be shared with colleagues outside of the recruiting team. It’s easier to get instant applications from candidates who identify one position they are very interested in. But what about the candidates who are interested in your company but not in any of your current openings? These candidates are critical for successful sourcing, they are ideally the candidates that you want to stay in touch with and build a relationship with. By offering them the possibility to join your talent pool, you can stay in contact until a position opens that is appealing to them. Previously, when a recruiter was sourcing candidates, they managed these relationships and kept this information in their own files. And then, when they moved to a new company, they had the unfortunate ability to take those candidates and all of their information with them. However, with a talent pool, you have all of the candidate information and also documentation of emails, calls, and any notes safely stored in your system. When sourcing, you often come into contact with candidates who have no prior knowledge of your company. Not only do you have to convince them of the position, you also have to convince them of your company. With a talent pool, you have a pipeline of candidates who have already expressed interest in your company. You can continue to keep them “warm” by staying in contact, sending nurturing emails and newsletters, and sending them relevant openings. This way, when they are ready for a new position, you are the first company that will come to their mind. In keeping sourced candidates “warm”, you are ultimately creating an improved candidate experience. The candidates in your talent pool feel connected to your brand. Through staying in touch with them, they feel that they are valued by your company and they remain informed of what is going on in your company. This will also lead to a positive on-boarding experience and overall work experience, as the former candidate is more familiar with your company culture. GDPR is an unavoidable topic in recruiting today. It’s something that every recruiter has to consider when planning their recruiting strategy. By saving all of the information from your sourced candidates in a talent pool, you can make sure that all data is saved and delete in compliance with the privacy laws. Check out our page "The Ultimate Guide to Candidate Sourcing" to find further resources on the topic of candidate sourcing. And check out our page "The Ultimate Guide to Talent Pools" to find further resources on the topic of talent pools. 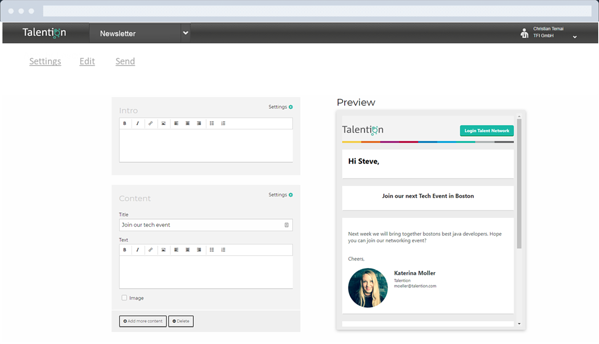 Talention offers a state-of-the-art talent pool tool. 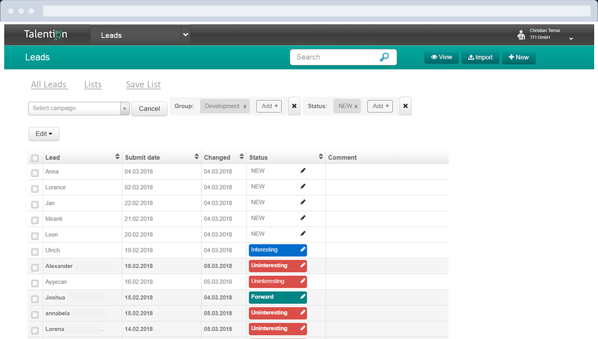 In a free non-binding demo, we would like to show you what your personal talent pool tool could look like.